We recently celebrated the January 27 anniversary of the liberation of Auschwitz. It reminded me of Bernie Sanders, proud proclaimant as democratic socialist. Here we are, 2016, as a country that sacrificed 58,000 vital Americans (not to mention 1,000,000 Vietnamese) in a struggle to stop socialist dominoes from falling on the United States. Not that I believe it was anything but a deadly economic development project with monstrous collateral damage. Anyway, we’ve arrived at a place where a candidate for president can proudly proclaim to represent everything that would prevent the USA from the greatness that we achieved in a country less than 200 years old. I use that number because that achievement is quickly eroding. The glory days are behind us. Now, a majority believes wealth comes as a result of a vote, not productive work. Those who believe that way haven’t ever seen capitalism so they don’t know the connection between that and our luxurious lives. The utter stupidity of free college for all is mind boggling. The same goes for healthcare as a right as stated in a Bernie ad on the radio. Most disturbing is the Republicans’ complicity in this nonsense. Ted Cruz, who is widely believed to be the most free market candidate for president is hated in Washington for his rejection of established order, yet he has said he will strongly enforce antitrust law to prevent “big oil” from stifling ethanol sales. I ask, what is not socialistic about antitrust law? Remember Marx’s definition of capitalism being private ownership of the means of production. If you own it, you control it. If you don’t control it, you don’t own it. Cruz, being a very intelligent man has to be a bald faced (especially compared to me) liar to say he supports free markets and antitrust at the same time. I would never discount the Nazi holocaust. But we watch tons of movies and Dawn keeps asking me if the next one is about the Nazis too. It was a terrible thing to plan to exterminate an entire religion. And the portfolio of anti-Nazi films since that time is awesome. Maybe it shouldn’t, but it puzzles me that the extermination of capitalists that came with the rise of world communism creates no excitement in the film industry. The numbers indicate the Nazis had a long way to go to equal the horror perpetrated by the communists. Could it be that people actually have come to believe the 100,000,000 deaths at the hands of the “democratic socialists” are justified because those victims unfairly took more than their fair share. Go ahead all you democratic socialists, proudly stand and be counted. The real capitalists will not commit genocide in an effort to hold the dominoes erect because they know your system will fail on its own as it did in the USSR, despite the big lie that Reagan’s arms race trounced the commies. 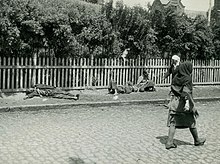 The photo at the top of this page depicts starved Ukrainians. Starved in spite of the promise of equal incomes for all in the socialist system. Socialism might be voluntary in a family or even community setting but the reality is socialism can’t exist without totalitarianism. And it won’t go away easily, evidence the rapidl growth with no pullback of government that we’ve seen since we were babies. To those age 35 and younger, socialism sounds pretty good. After all, these younger voters have spent their entire schooling years, their formative years, being taught that Capitalism and Free Markets are the ruination of everything and are the reason for the income disparity in the U.S. Read Peggy Noonan in Saturday’s (01-30-2016) Opinion section of the WSJ. She makes a very good point, I believe. It can also explain Trump’s popularity among the old and young. What about the Israeli holocaust where the victims are not Jews, but Palestinians? One dare not suggest publicly that what is going on in the West Bank and in Gaza is a Jewish holocaust of Palestinians. You join me as a heretic to the religion of Zion. Oh Lord, please don’t let me be misunderstood. Or… what about that American exceptionalism we so puff out our chests about. I’m speaking of Mosaic Law.